While enjoying the view of the Niagara Falls waterfalls is the foremost reason for visiting, there are plenty of other activities and attractions on both sides of the US-Canadian border. Before getting to those. I first want to take a moment to thank those responsible for preserving the area back in the late 19th century. Niagara Parks Commission informational plaque overlooking Horseshoe Falls at Niagara Falls, Ontario, Canada. Nikon D700/28-300VR, 1/125s, f/16, ISO 220, EV -0.3, 28mm focal length. 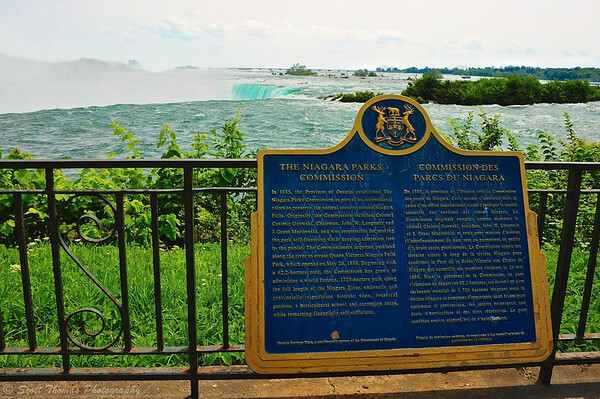 In 1885, the Province of Ontario established The Niagara Parks Commission as part of an international effort to preserve the natural scenery around Niagara Falls. Originally, the Commission included Colonel Casimir Gzowski, Chariman, John W. Langmuir and J. Grant Macdonald, and was responsible for making the park self-financing while keeping admission free to the public. The Commissioners acquired parkland along the river to create Queen Victoria Niagara Falls Park, which opened on May 24, 1888. Beginning with a 62.2-hectare park, the Commission has grown to administer a world famous, 1720-hectare park along the full length of the Niagara River, nationally and provincially significant historic sites, botanical gardens, a horticultural school and recreation areas, while remaining financially self-sufficient. Through the effort of these men and other like minded individuals in New York state, Niagara Falls is surrounded by parks and carefully maintained structures which do not take away from the beauty of the waterfalls. While the parks are technically free to use by the public, it does cost money to park cars there. Concessionaires from kiosks, shops, restaurants and tour operators cover the rest of the park’s operating expenses maintaining the self-sufficiency of the Commission. Fun things to do in Niagara Falls, Ontario, Canada. 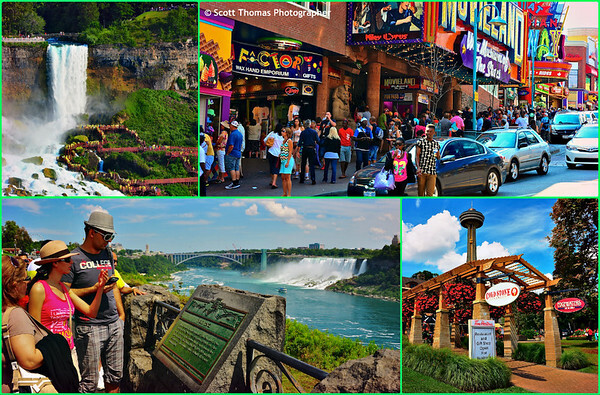 From top left: Tourists in yellow raincoats below Bridal Falls, tourists on Clifton Hill, restaurants across from Queen Victoria Park, tourists at Table Rock historical marker. The waterfalls are the biggest attractions in Niagara Falls. On both sides of the border, you can travel down to the bottom of the gorge and walk next to the mighty waterfalls on very wet and slippery decking. Styling in yellow raincoats provided to keep people dry. On the Canadian side, you can walk up Clifton Hill where all manner of attractions from midway-like rides to wax museums await you and your money. Souvenir shops sell anything labeled Niagara Falls and/or Canada. Motels, restaurants and counter service places fill the spots in between. Across from Queen Victoria Park are sit-down restaurants with outdoor patios which overlook the waterfalls. The Skylon Tower beyond has two revolving restaurants and observation decks. People like to stop and read about Table Rock which was the first major vantage point for tourists in the early and mid-19th century. I wonder if it cost them $20US to park their horse and buggies back then? The Deluxe Sightseeing Tours Red Double Decker bus full of tourists drives past the Niagara River gorge and falls at Niagara Falls in Ontario, Canada. Nikon D700/28-300VR, 1/400s, f/10, ISO 200, EV 0, 42mm focal length, cropped. 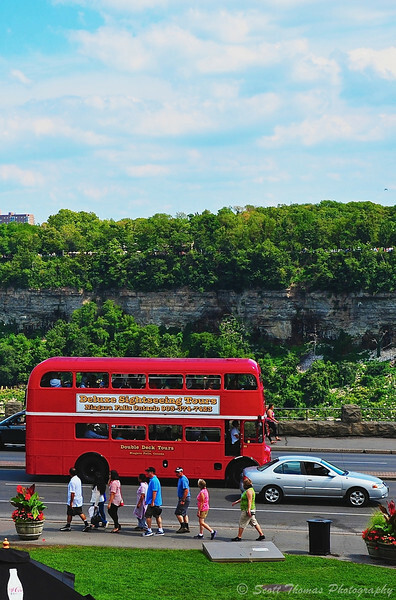 Besides the Maid of the Mist boats, you can take double-decker bus tours, jet boat excursions and helicopter rides along, in and over the Niagara gorge. 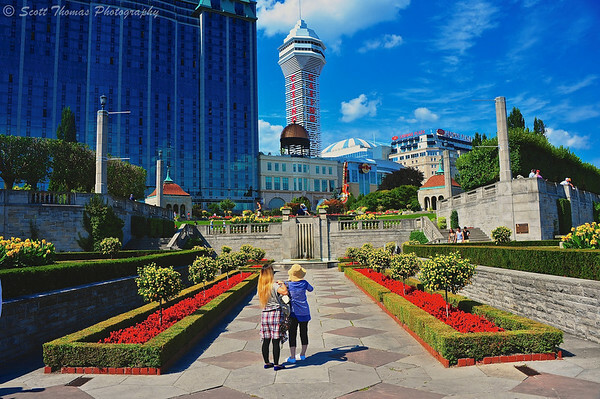 Tourists stop to photograph the Casino Niagara behind Queen Victoria park at Niagara Falls in Ontario, Canada. Nikon D700/28-300VR, 1/80s, f/14, ISO 200, EV -0.3, 28mm focal length, polarizer filter. I would be remiss not to mention the impact of the casinos. The Niagara Fallsview Casino Resort opened in June of 2004 on the Canadian side followed by the Seneca Niagara Casino & Hotel eighteen months later in the United States. Before the casinos opened, the tourist areas were rundown with old and poorly maintained hotels and attractions. Now, these areas have all been upgraded or replaced with modern and internationally known brands like the Hard Rock Cafe and Rainforest Cafe restaurants and Marriott and Hilton Hotels. Older hotels have either been replaced with new attractions or remodeled to keep pace with their competitors. Still, with all that is going on around them, it is the natural beauty and awesome power of the waterfalls which grab people’s attention. People come from all over the world to experience the American and Horseshoe Falls at Niagara Falls in Ontario, Canada. Nikon D700/28-300VR, 1/125s, f/16, ISO 500, EV -0.3, 35mm focal length. They are in a word…magnificent. 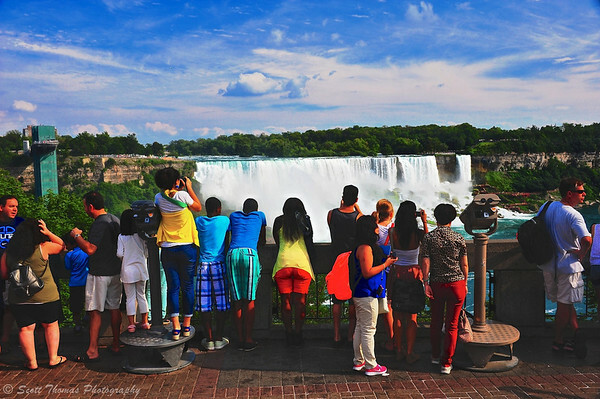 This entry was posted in Travel and tagged 28-300mm, american, blue, bridal falls, bus, canada, circular polarizer, clifton hill, clouds, commercials, double-decker, filter, gorge, historical, history, horseshoe, marker, new york, niagara falls, nikon D700, ontario, parks, plaque, raincoats, red, sky, skylon tower, summer, table rock, tourists, united states, vr, water, waterfall, yellow. Bookmark the permalink.